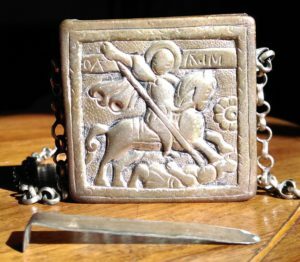 Medieval pilgrim badges were among the most common souvenirs brought home from visits to European shrine sites. They were worn at eye level on hats and shoulder capes, sewn into prayer books, and adorned pilgrim bodies laid in their graves. Today’s trekkers to Santiago mark their backpacks with the traditional scallop shell and purchase endless variations of that icon emblazoned on kitchen tiles, refrigerator magnets, jewelry and even their hiking socks. Insignia are public announcements, billboards for piety or bragging read at a glance. Other historic pilgrim accessories appeal to literacy at least as a cultic gesture. Many short texts were never read at all. They simply served as visual scripts for their bearers’ good intentions. Pilgrims – or any travelers wishing to make their journey sacred – could take along some­thing written even if only as an amulet. Here are a small selection of such objects from various historical moments and contexts. The Orthodox Crescent arcs from northern Egypt to Finland with numerous shrine sites along that vast geographical span. They are normally work­ing monasteries with Mount Athos island in Greece the best known clus­ter of religious communi­ties in one of the most spectacular settings. Monastics them­selves often become pilgrims who jour­ney to venerate the icons and sacred images that compete for honor with bodily relics and tombs. Professed religious often carry por­ta­ble devo­tional objects with them, some­times just for the imagery and some­times with textual reminders of the prayers they may recite along the way. Some artifacts that include writing with their imagery help prompt live storytelling of miraculous events or episodes from scripture. 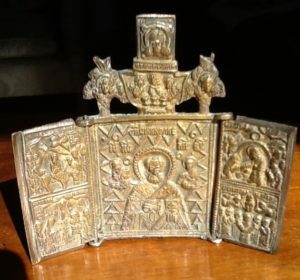 Wearable Byzantine case, 19th cent.? 4.5 x 4.5 cm, chain 24 cm, metal, private collection, photo © George Greenia. 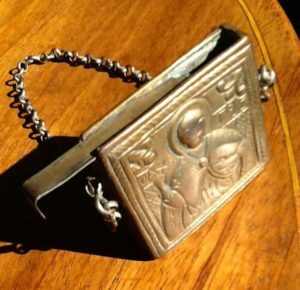 This small metal box has a short chain, so the case could hang on a vendor’s rack, the traveler’s kit, or be left as a votive offering at a shrine site. A sliding metal tab along the top seals an inner compartment which could contain a personal relic, blessed oils preserved in wax, or a small packet of written material. The writing on the outside of this case simply names the saints on either side. Byzantine triptych, 19th cent. ?, 9 x 10.5 cm, metal, private collection, photos © George Greenia. 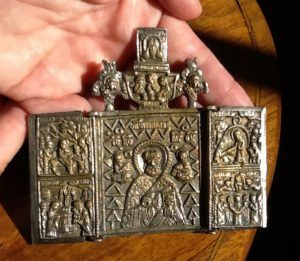 The palm-size metal triptych is also scaled for private devotions on a home altar or espe­cially for travelers because of its minimal weight and because it folds up so readily to protect the devotional surface. The wri­ting is limited to the names of the figures or the scenes depicting the life and miracles of St. Nicholas. 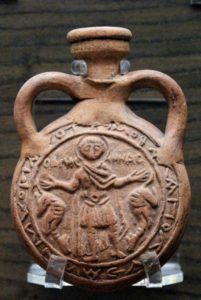 Pilgrim flask representing St. Menas with two camels. From the area of Alexandria, Egypt. Common from 6th-7th cent. 14.5 cm x 10 cm; depth 3.2 cm, clay, Louvre, Creative Commons. 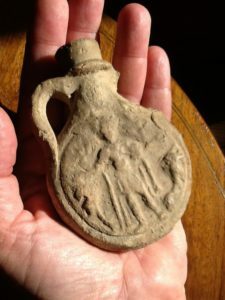 Pilgrim flask representing St. Menas with two camels. From the area of Alexandria, Egypt. Common from 6th-7th cent., clay, private collection, 14 x 7 cm, photo © George Greenia. This small vessel is a pilgrim’s flask destined to contain water, oil or sand from a sacred site. St. Menas flanked by camels was the icon for the saint’s shrine west of Alexandria where pilgrims took oil from the sanctuary lamps to carry home with them. Flasks were formed from clay disks pressed into molds to capture images and script. These disks were sealed together and loop handles pasted on. The interior volume is irrelevant. Just possessing some of the material substance gathered at the shrine site was enough for travelers and proof of the completion of their mis­sion. Those on a quest are the first beneficiaries of the power of their souvenirs but they function as a boon for their home communities as well. The first image shows a well preserved, museum-quality St. Menas flask but thousands more survive as travel-fatigued items in private collections, as in the second image. The Christian West and Orthodox East in general have rates of lay literacy higher than in the Middle East, especially in liturgical languages. They also boast a vast range of iconography in the plas­tic arts. Medi­eval scrip­toria flourished in admini­strative centers, both lay and ecclesias­tical, in­creasingly around universities and for a growing late-medieval lay market as well. Their pilgrim sojourners came from every social class lay and professed, and they collected souvenirs such as ampules of water and oil, pilgrim badges, carvings and icons. Ethiopian travelers represent a distinct class of pilgrim. 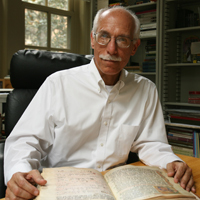 Like their Orthodox coun­terparts, they retain a unique liturgical language, in this case written in Ge’ez, the ritual idiom of Christian Ethiopia much like Old Church Slavonic or antique forms of Greek for portions of the East, or Latin for the Christian West. Mastery of Ge’ez remains confined to a literate priestly elite. Ethiopian reli­gious books don’t just contain sacred texts, they are sacred objects in themselves, and their images are strikingly apotro­paic: they produce and induce the spiritual realities they illustrate. The portraits of Christ, Mary and the saints and especially the endlessly repeated angels’ eyes make those forces effective in the real world. Within the Ethiopian catchment regions, religious books are routinely hand crafted by individual monks, not the output of organ­ized shops. Individual monks pro­duced written texts as a sacred craft, rarely as an industry increasingly dominated by laymen as in the West. Their books commonly stay in the possession of monks who use them for daily prayer and carry them on their errands and journeys. With literacy more confined to a monastic caste in Ethiopia and work­ing with a smaller repertoire of iconography, devotional objects on goatskins and as worked brass are scaled down in size. Lay people tend to collect “prayer scrolls” carried as amulets. Many of these scrolls are talismans whose prayers address specific needs and protect against disease. The person who commissioned the manuscript is as often as not a named woman and the prayers she requested include petitions concerning feminine ailments or to ward off dangers like the evil eye, or a prayer for catching demons in Solomon’s Net. These women wanted written prayers even though they could not read them and wore them under their clothing and in contact with their flesh. Some scrolls were sewn tight in leather pouches, never to be opened again. The fact that no one would ever read these prayers aloud did not trouble their owners who themselves became “mobile shrines” as they carried sacred objects about on their persons. The texts on these inaccessible strips of animal hide were placed in the sight of God alone and entrusted to His readership. These believers converted their textual accessories into moveable shrines and made of themselves pilgrims in a self-referential way, carrying the sacred forward to sanctify all the places they visited and worked, accompanied by the transcendent inscribed on parchment scrolls nestled next to their skin. Yemeni devotional case for prayers or sura of the Qur’an. Mid-20th cent., copper and silver alloy with paste glass “rubies,” 7.5 cm wide x 11 cm tall with bells, metal chain approx. 30 cm in length, photo © George Greenia. Finally, an example from Yemen. This rectangular case is similar to the first object but comes from the Islamic tradition. It bears passing resemblance to the Jewish mezuzah which is affixed to the doorpost of a home and never travels at all. 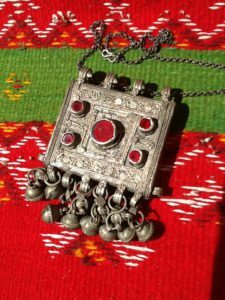 Composed of a handcrafted alloy of silver and copper set with glass “rubies,” this Yemeni case’s bells suggest movement, either processional or on pilgrimage. It too is outfitted with a chain for personal wear or placement in a devotional setting. Although now completely sealed, the box has a hollow interior for a short passage from the Qur’an. ‘What Real Clerical Spell Scrolls Look Like. Ge’ez and Amharic Examples‘ by R. D Reed, in Cyclopeatron. Friday 17 June 2011. Web resource, accessed 17 May 2017. Next Next post: Much Eaten by Mice: a fragmentary pilgrimage itinerary by Sir Gilbert Hay?